The ‘integrating crop and livestock production for improved food security and livelihoods in rural Zimbabwe’ project in Zimbabwe aimed to promote more diversified and better integrated crop-livestock farming systems by, among other interventions, promoting better access of women to higher value crops and livestock. The project used innovation platforms to introduce better livestock feeds, improve market linkages for farmers to benefit from higher livestock productivity and to enhance knowledge and skills among support services enabling upscaling of the impacts of the integrated crop-livestock systems. and standing in their family and community. contribution to total incomes increases, as does their decision-making power and confidence. but also stronger families and communities. Homann-Kee Tui, S., Senda, T., Dube, T. and Rooyen, A. van. 2018. 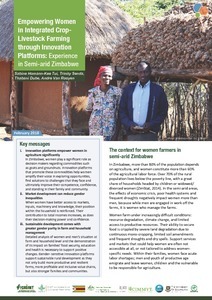 Empowering women in integrated crop-livestock farming through innovation platforms: Experience in semi-arid Zimbabwe. Hyderabad, India: ICRISAT. This brief is a product of the ‘Integrating crop and livestock production for improved food security and livelihoods in rural Zimbabwe’ project financed by the Australian Centre for International Agricultural Research. Tags: ACIAR, ICRISAT, innovation platforms, ZimCLIFS. Bookmark the permalink.